Cabernet Sauvignon Merlot by Wignalls of Great Southern, Mount Barker. A currant and bramble, plum and cocoa flavoured palate, seasoned with fragrant oak spice and supported by lengthy, savoury tannins. The wines of Wignall were met with resounding success from the first release, inaugural vintages saw amazing results, attracting conspicuous gold medal and trophy victories. 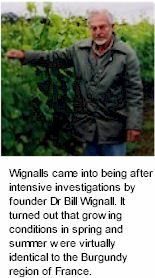 Wignalls were established in 1982 after investigations into the local geography by founder Dr Bill Wignall. Long memorable finish of fragrant blackberry cassis notes and refined, fresh acidity. First vintages saw amazing results with Gold Medals and Trophies for both varieties. 1985 created a lot of excitement – the Pinot Noir won a major Gold Medal, and subsequently the 1985 Chardonnay won Australia’s richest wine prize for Western Australia’s Best Table Wine - an all expenses paid trip to France’s famous wine regions! Subsequently over fifty Gold and Trophies have been received by this boutique winery to date, both domestically and Internationally. Wignalls believe that localised conditions or terroir is the main reason for the numerous successes. Perfect attention to detail, with a sophisticated trellis system to maximise sunlight access and air circulation, greatly assist with vineyard growing practices. Pruning (June to July) and picking (March to April) is by hand, thus the wine is as natural and clean as is possible. Wignalls have had a strict policy of not spraying pesticides since 1988 and work on a permaculture system, the vineyard works with mother nature and not against her. In 1997 the Wignall family decided to erect a modern winery on the vineyard to maximise the benefits of the superior grapes they were growing each and every year. The move proved to be a wise one, crystallizing the returns for this family operated boutique winery. Robert and Claire Wignall took up the sucession of Wignalls stewardship over parents Dr Bill and Pat Wignall. A new era in winemaking heralded a major upgrade of the Wignalls label, and the opportunity to introduce some exciting new releases. Wignalls has branched out with popular styles, an Unwooded Chardonnay and Cabernet Merlot to suit everyday tastes, contemporarily styled wines to compliment the range of super premiums. Development of the Albany vineyard has proceeded steadily with approximately 35,000 vines or 22 hectares in loving care. Whilst seeking to accomodate modern tastes, the estate will only ever produce straight varietal wines, as it has no intention of ever making a classic white or red blend. Wignalls have won more gold and trophies than there is room to mention. In 1990 the estate Pinot Noir claimed Chairman’s Award for Western Australia’s Best Individual Wine Sheraton, Perth WA Wine Awards, and SGIO’s Travel Award (North America) for Western Australia’s Best Table Wine, and again in 1991. In 1992 the Chardonnay claimed Champion Dry White Table Wine Australian Small Winemakers Show. 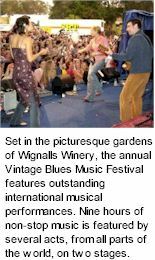 Wignalls 1993 Pinot Noir came into folk lore as the wine that won Gold in every show shown around Australia except Perth. In 1994 Wignalls was awarded Trophy at the Perth Sheraton Wine Awards by Len Evans. In 1998 the Chardonnay was awarded Highest Gold Medal (in the world) and Best Australian White Wine at the Japan International Wine Challenge.